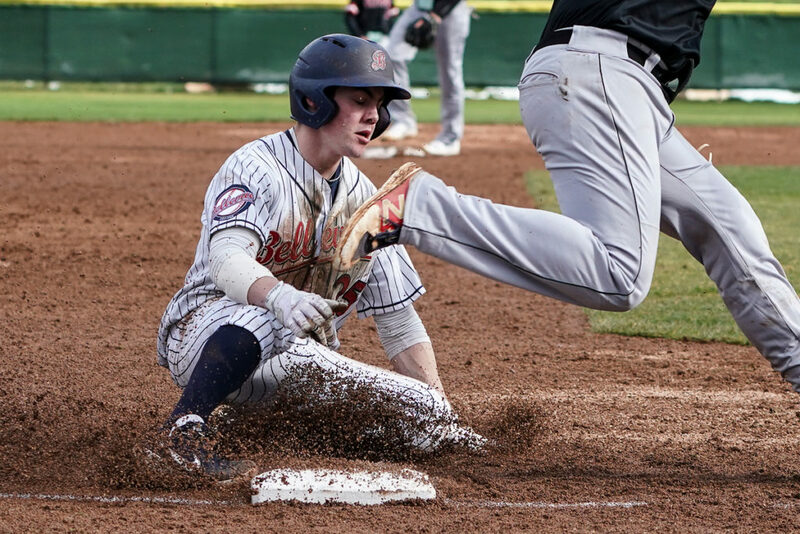 Bellevue College baseball won three of four for the second weekend in a row defeating Walla Walla 14-3 and 6-5 on Saturday March 23 before splitting at Columbia Basin yesterday winning 10-5 before losing 8-2 in Pasco. The 3-1 weekend record ends Bellevue’s pre-season with an 11-6 record which was shortened by three games that were snowed out in late February against Mount Hood but will be made up in two weeks in Bellevue. In the Saturday 14-3 win over Walla Walla, the bats were hot as Jake Terao, Ethan Smith, and Riley Gill led the way with multiple hits. Smith homered while Terao had two doubles and a triple with three RBI’s. Gill had three RBI’s as well, along with three hits and a stolen base. Nick Miller ran his record to 3-1 on the mound while Warren Utschinski struck out four in two shutout innings of relief work to lead Bellevue. In game two, the ‘dogs had to come from behind a resilient Walla Walla squad with two runs in the seventh to win 5-4. Eric Anderson went 5 1/3 innings in long relief while Andrew Ellingson survived a ninth inning scare to earn his third save of the year on three consecutive ground outs after allowing Warrior runners at second and third base with no outs. Dylan Ames, who entered the game as a pinch hitter, had the clutch two-RBI single to win it for BC. Yesterday, after waiting out a 2-hour rain delay in Pasco, the Bulldogs took game one behind Smith’s hot hitting, who homered and tripled for Bellevue. Dominic Marinez had three hits. In game two, the teams were gridlocked at 0-0 until CBC’s big fifth inning, putting up five runs to keep momentum out of Bellevue’s hands despite the continued hitting of Smith, who had another two hits in the game. For the weekend, Smith had seven hits, two home runs, and raised his slugging percentage to an NWAC-best .941. The Bulldogs begin league play this weekend with a four-game series against Everett. Saturday’s doubleheader is set for a 1:00 p.m. first pitch at Everett Memorial Stadium before returning back to Courter Field for Sunday’s twinbill which is also set for 1:00 p.m.